Cartridge faucets offer the ideal combination of performance and ease of use. Since T&S knows you use them for a variety of applications, we offer a range of cartridge options. Our standard compression cartridge is the Eterna model. We make Eterna cartridges for standard faucets and Eterna with spring checks for pre-rinse units to prevent cross-flow. Standard cartridges like Eterna function by the turning of an interior spindle. When the faucet handle is turned, the spindle lifts from the seat to rise and to create an opening in the flow path. The more the handle is turned, the higher the spindle continues to rise and the larger the opening becomes to the point where it is fully opened. You will notice that the Eterna spindle is installed inside a removable insert, which contains that up and down movement. Some of our competitors don't include this insert in their compression cartridges, which means that their spindles lift up and down inside the faucet body, itself. Our superior design ensures far less wear and tear on the faucet body while delivering reliable performance. Spring checks prevent cross-flow and comes standard on our pre-rinse units. Other parts are added to the cartridge assembly to ensure that it will hold together and function well. A gasket on the very bottom of the cartridge ensures that there are no leaks from the underneath. A screw attaches the seat washer to the spindle, and it is this seat washer that keeps a good seal on the water path when the faucet is turned off. A combination of a bonnet, gasket, packing, and packing nut, ensure that the cartridge is hold firmly in place and a screw and hot or cold index attaches the faucet handle to the entire assembly. Splines on both the cartridge and the inside of the faucet body lock together to guarantee each cartridge stays put. Inspecting Eterna cartridge is fairly simple. Simply unscrew the faucet handle, and then loosen the bonnet completely. Those parts, and then the cartridge itself should slide out vertically without any resistance. If, due to calcification, the cartridge is not easily removable, just screw the handle back onto the stem, turn the handle, and pull the cartridge out using the handle itself. If you're checking for leaks, look for the washers, gaskets, and packing. One of them is inevitably the culprit. Replace any of these parts is as simple as disassembling that part of the cartridge, removing that worn part, and replacing it with a new one. 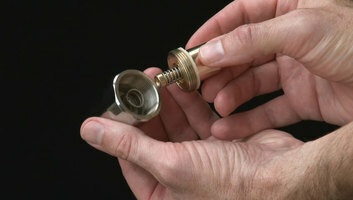 T&S makes it easy to locate and order new parts for all of our faucet. We even offer replacement cartridges as a unit. T&S is known for high-quality and innovation, and it was only a matter of time until we took the cartridge one step farther. We created a cartridge that performs so well, that we give it a lifetime warrany. This is our Cerama cartridge. Unlike Eterna cartridges, Cerama is available as a virtually one-piece unit. By assembling all of the parts as one unit, we've eliminated one of the main places where the cartridge might have leaked. We were able to do this because of how Cerama functions. The faucet handles on Eterna, as you'll remember, rotate and life a spindle from the bottom of a removable insert. Cerama simply turns 2 ceramic disks against each other to open a pre-fabricated water path. Ceramic is one of the highest-grade materials available and is so durable, that we offer this cartridge with a lifetime warranty. And, like our Eterna cartridge, T&S offers the only ceramic cartridge with spring checks in order to prevent cross-flow. You can open and close a ceramic cartridge all day, and it will never break or wear out. And we've already removed the interior seat washer that sometimes becomes the culprit in a leak. Inspecting a Cerama cartridge, then becomes even simpler. If there's a leak, it's almost certainly due to wear on the bottom gasket of the cartridge or to erosion of the bonnet or handle assembly. Removing the cartridge and taking it apart is similar to Eterna, only with much fewer parts to separate. T&S sells gaskets and other parts of the bonnet and handle assembly should you ever need them. And if you ever have a Cerama cartridge fail aside from normal wear and tear, simply return it, and we'll replace it free of charge. The third cartridge we offer at T&S is the metering cartridge. 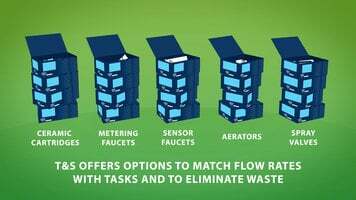 There are many environments where metering water is the best decision. And mechanical metering always uses a cartridge. The first difference you'll notice in our push-button cartridge is the handle. Instead of using a handle that turns the cartridge, the push-button metering cartridge uses either a push-button or pivot action. With either push-button or pivot action handle, the actuation of the cartridge shifts from being a circular motion to a vertical motion, up and down. The T&S wrist action metering cartridge, the only one of its kind in the industry, uses a cam to actuate the cartridge when its wrist blade handle is turned. Like we do with Cerama, we make and sell metering cartridges in as few pieces as possible. Those pieces are the bonnet assembly and the cartridge assembly. A push-button handle is then added with an insulator protecting from heat and friction. Removing and inspecting a metering cartridge is perhaps the simplest of all and involves unscrewing the entire cartridge as a unit. Since there are 2 main washers in the metering cartridge, those will be the ones to inspect: one at the bottom of the unit and another above the screw threads where the cartridge meets the faucet assembly. If you're experiencing a leak, one of these needs to be replaced. To adjust the timing of the metering, simply remove the handle assembly using a hex wrench. Rotate the metering screw in 1/8" increments, clockwise for longer flow time and counter-clockwise for shorter flow time. Our slow-close metering cartridge is also available on bubblers and on special applications, like handwashing and outdoor applications. Faucet cartridges - they offer both performance and ease of use. And T&S makes it even easier with a variety of cartridges to meet your needs: Eterna and Cerama, both available with spring checks; slow close; and metering. T&S offers a variety of cartridge faucets so that you can select the one that best suits your needs and application. Featuring Eterna, Cerama, slow close, and metering, the cartridges are built to deliver superior performance and ease of use. This ADA Compliant T&S B-1029-PA concealed straight valve is perfect for use in your hotel, motel, or other commercial shower or bath facility. It features an adjustable flow, vandal resistant pivot action metering cartridge with an attractive 2 3/16" diameter flange with set screw. 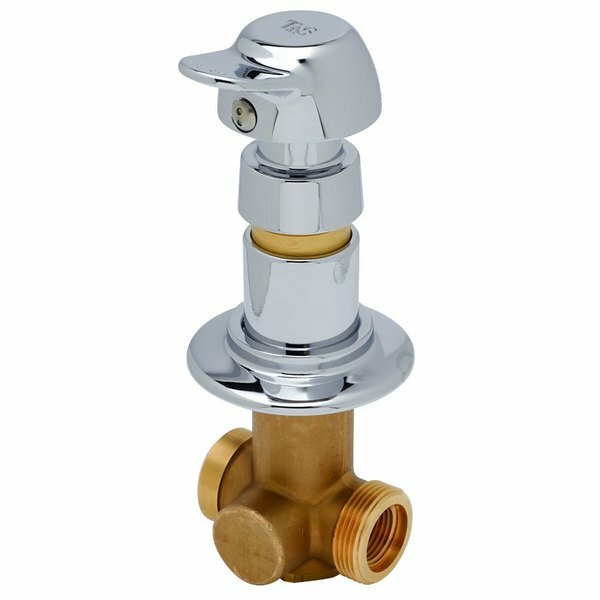 Each B-1029-PA concealed straight valve is designed with a 1/2" NPT female inlet and outlet.